The Marmot Minimalist rain jacket strives to be exactly what the name promises: a simple, functional piece of rain wear without too many bells and whistles to bog you down. On the women’s version you’ll get two main pockets, cinches at the hip and hood, and velcro adjustments at the cuffs. That’s it! The Minimalist is made with a 2.5 layer Gore-Tex Paclite membrane, which means this jacket sheds water well and is moderately breathable. For those of you with an eye towards sustainability you’ll be pleased to hear the Marmot Minimalist has been redesigned in recent years and is now made of 100% recycled fabric. Aside from the recent material update the Minimalist has remained largely unchanged, and persistently popular for years. Because of its lasting presence, functional design, and moderate price tag we’re dubbing the Marmot Minimalist our Classic Pick for Wilderness Backpackers. The Marmot Minimalist stays true to its name. A solid rain jacket with key features you want, and nothing you don’t need. The 2.5-layer Gore-Tex Paclite breathes well, layers with ease, and packs down small. The Minimalist earns bonus points for being a 100% recyclable jacket that can transition through multiple sports and storms. See the full Marmot Minimalist review below. Weight 13.6 oz. (385 in g) Light, but not extremely light. In recent years the Minimalist has been passed up by other super light rain jackets. Layer 2.5-Layer A 2.5-layer rain jacket has a good mix of waterproof protection, breathability, and comfort against the skin, all while staying fairly lightweight. More on rain jacket layers in our Guide. Waterproof Membrane Gore-tex Paclite Paclite is a common membrane used in 2.5-layer rain jackets. One of the best for breathability and packability. More on rain jacket waterproof membranes in our Guide. Face Fabric 100% Recycled Polyester The Marmot Minimalist is now made with 100% recycled polyester, which is a huge improvement. The DWR coating is also PFC-free. No. of Pockets 2 zippered hand pockets (1 chest for men) On the women’s, there are just two zippered hand pockets. The men’s has a chest pocket, which we think the women’s should have as well. Pocket Placement Casual The hand pockets are covered by a backpack’s hip belt, which is not ideal. Better for casual use, but the Minimalist is meant as an outdoor trekking shell. Pit Zips/Vents Yes Good pit zips to help dump heat when hiking uphill in the rain. Water Resistant Zippers No The zippers themselves aren’t water resistant, but Marmot includes snaps and flaps to help keep water out. This is a premium feature that the Minimalist price point typically doesn’t cover. Storm Flaps Yes Storm flaps, Velcro, and buttons over the zippers helps to keep water out. Packs Into Itself? No While it doesn’t pack into a specific pocket, it does pack down pretty small. Hood Attached, 3-point adjustability The hood is excellent, with full coverage and 3 points of adjustability. Fit Casual Marmot made the Minimalist more of a casual fit, specifically to layer over other clothes. Seams Fully taped No water is getting in through the seams. Manufacturer Warranty Limited Lifetime Marmot has a great warranty, so if zippers, toggles, or anything breaks send it in. Remember to re-apply DWR yourself! Retail Price $189.00 A fair price for a medium quality rain shell with a long history of working well. You’re paying for the Gore-Tex Paclite, Marmot’s fit, and a nice hood. When the Marmot Minimalist arrived at the door the first thing I did upon seeing it was laugh. The Backpackers.com’s editor had shipped me the exact jacket that was hanging in my front hall. Well, except this new one didn’t have any ice axe holes, stains, or lingering body odor smells from years of frequent use. A fresh Marmot Minimalist, ready to tackle rain and snow. Knowing that my previous Minimalist had already impressed me over the course of the years I’d owned it, I felt totally confident throwing this new Minimalist into my pack for a weekend-long avalanche safety course in British Columbia. Over the course of the weekend I took the jacket on and off innumerable times — as is par for the course when you’re skiing uphill and then stopping to talk for long periods of time. I stood in the snow for hours, and I carelessly shoved my gloves in my pockets as I hurried to set up my avalanche beacon during our timed drills. Trekking in the Minimalist. Must not fall. Again and again this jacket impressed me with its fit and waterproofing. After that avalanche training class I took the Minimalist out on weekend hikes, morning commutes, and many a ski touring trip. I never got tired of this jacket, and I could always fit another layer under it. 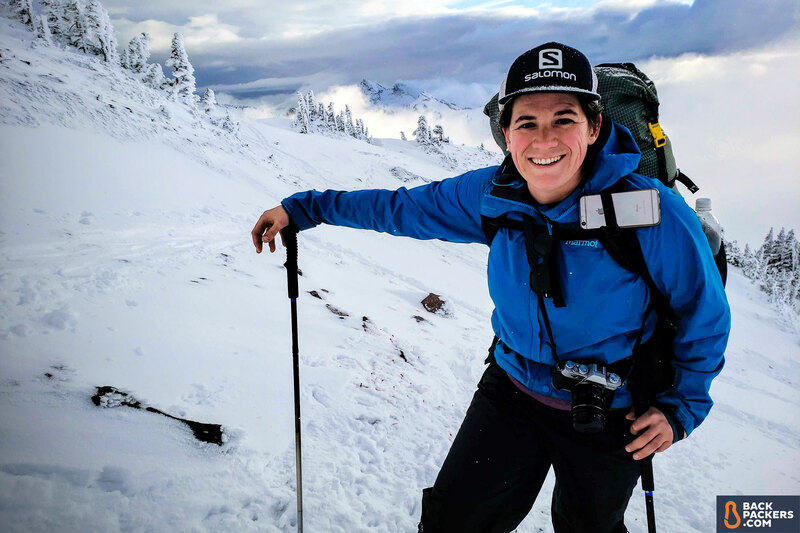 Snowshoe adventure during Seattle’s massive blizzard? Better bring the Minimalist. As anyone who plays in the outdoors knows, having a go-to jacket that can serve as a great water and wind shell in various conditions is priceless. I also appreciate how Marmot has designed the Minimalist with a slightly longer cut on the sleeve and hem, allowing the jacket to cover you fully even when cinched under a backpack. The Marmot Minimalist is just long enough to fit under a backpack’e hip belt (the ULA Circuit), which gives you more coverage. Alright gear heads, let’s dig into some stats! As mentioned previously the women’s Marmot Minimalist has two basic hand pockets which are closed with both zippers and velcro flaps, and are situated right about where you’d wear a hip belt. The men’s version of the jacket also features a chest pocket. So gents, in addition to benefiting from the patriarchy, you also get a jacket with a pocket that isn’t impeded by wearing a pack. The zippered hand pockets are in a fairly casual position, great for walking around in the rain, not so great for backpacking. They close with a zipper and velcro storm flap, which helps to keep water from getting inside. Regardless of where you fall on the gender spectrum the main zipper also features the same closure method as the hand pockets. The zipper and velcro combo does a decent job of keeping water out, but it should be noted that the pockets aren’t totally waterproof (and that the zippers themselves don’t have any waterproofing elements, like some jackets). On both models you’ll also get an attached hood with three adjustment points (top, and two sides on the front) and cuffs with velcro for tightening. The Marmot Minimalist hood has 3 adjustment points, two pictured here and one in back. The brim is deep and stiff, keeping snow or rain off your face. Buff not included! The fabric on the Minimalist is where Marmot has really been making some forward strides. The Minimalist has long featured a multi-layered Gore-Tex membrane that blocks water and wind. However, the newer version of the jacket is made with 100% recycled materials and goes a step further by using a water repellant finish that is PCF-free. I’ll save you a trip to the Google machine and tell you that PCF stands for perfluorinated compounds, which are non-natural and don’t break down in the environment – they’re actually one of the worst polluters in the outdoor industry, and used in a huge number of products. Velcro at the hands and a 2.5-layer waterproof Gore-Tex membrane keeps the water out! Despite this looking like its wetting out (damp fabric), no water gets inside. All in all this jacket will run you 13-15 ounces depending on the size, or just about half a full Nalgene bottle. The Minimalist is cut with enough room to layer my warmest puffy underneath, long enough to go under my backpack, and the arms are long enough that my wrists don’t freeze while using trekking poles. However, I’m docking half a star because the front pockets sit right under a hip belt. And I’m docking a full star because the women’s version doesn’t have a chest pocket! Fix your gender bias Marmot! The jacket layers well and is comfortable, but has two main issues. No chest pocket for women (come on! ), and hand pockets that sit right at the hip belt level. Move the pockets up so you can use them with a backpack’s hip belt. There have been some rumors that the newer Minimalists are a little less durable, and frankly that kind of assessment is outside the scope of most reviews you’ll read online. But I will say, if the new Minimalist is even half the jacket my old one is, it’s worth the cost. This jacket has the same issue that almost all rain jackets do — it’s easy to overheat when you’re moving uphill. However, breathability and water resistance are not the closest of friends, and this critique certainly isn’t unique to this jacket. Pit zips allow the Minimalist to breathe, but even with that a hard uphill will get your insides sweaty. While Paclite (the membrane) is decent, it just isn’t enough to remain truly breathable. This jacket is actually quite waterproof and I’ve never had an issue with the seams leaking. I’m taking a point off because the main zipper isn’t waterproof even with it’s storm flap. One odd thing about the Marmot Minimalist is that the exterior fabric will look like it’s soaked through even while I was dry on the inside. The jacket is quite waterproof, even though the zippers don’t have any special waterproofing material or design. The jacket looks like it’s wetting out on the right, but it’s not. None of that water leaked through, and my insides were mostly dry, except when my own sweat got the better of me. The Minimalist is sized for what Marmot calls their “Regular Fit,” and I can attest it fit me very regularly. I wear a medium in most brands but when the Backpackers editor reached out to me test this jacket I asked for a large, thinking it would give me more room to layer. Well, I was right about more room, but wrong about how much larger the next size would be. For me the large was definitely too big. One thing I love about the Minimalist is that it’s cut with enough extra room to layer a puffy underneath without feeling too constricted. I also particularly like that it’s cut long enough to sit comfortably under a hip belt. For this jacket I’d recommend your standard size, and if you’re typically on the small end of a size, even sizing down. Why doesn’t the women’s jacket have a chest pocket but the men’s does? Has any woman actually said they would prefer no pocket instead of a chest pocket? In 2019 can we really keep forgiving brands for cheaping out on features on women’s products? I say no, and for this I’m really disappointed in Marmot. Additionally, the placement of the hand pockets are too low for them to be used with a hip belt. Which means if you’re wearing the women’s jacket and a backpack at the same time this jacket has a grand total of zero pockets for you to use when backpacking. It’s a shame. These are my primary grievances for this jacket. They’re not unique to Marmot — many companies do a similar sort of thing for women’s versions of jackets. But for a company that prides itself on jackets, specifically rain jackets, you’d think they would have dialed in the women-specific model. As I’ve said before, the cut, colors (in the two genders offered), and general design are pretty solid for a simple, do-it-all rain jacket. The Marmot Minimalist is an excellent rain jacket for outdoor folks who want a one and done shell and are themselves minimalists. We tested the Women’s Marmot Minimalist. It is also made in a Men’s, which is roughly the same, except it includes a zippered external chest pocket that’s watertight. We really wish the women’s had this as well! Otherwise there is only one real version of the Minimalist (the Component Minimalist has a removable thermal layer, which is an entirely different category of jacket), and we do recommend it for people that want a solid rain jacket that will last. Compare Marmot Minimalist prices below.